So I won’t lie – this gig, it’s got perks. And one perk is getting the early scoop on things to eat around town before they get all popular and crowded. Working on a story for the upcoming 2017-18 Wilmington & Brandywine Valley Visitors Guide, I spoke with three of my favorite local chefs about the places they’d recommend to someone visiting town for one weekend. They had lots of ideas – look for the entire chat in the guide when it comes out – but among everything they suggested, three off-the-eaten-track, not-what-you’d-expect suggestions stuck out. And so I used my advance knowledge to go grab some grub. Every chef I know has been raving about this joint for the past year or so, but it was Dan’s recommendation that made me stop one night on the way home to bring food to the family. 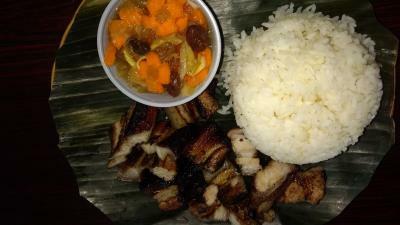 The Philippine Smoked BBQ and Grill in Elsmere, across the street from the VA Hospital, is in a part of town that you’re not likely to stumble across if you’re hitting the usual tourism hotspots, but it’s just a short drive from downtown Wilmington, and worth it. The owners weren’t there the day I stopped by, but the pride they take in their food was well represented by their enthusiastic staff, who told me about how the pit master has no formal training (hey, I’m on board) and how they’ve already been featured on the Travel Channel as having the best BBQ in Delaware (and they have). I don’t want a pick a fight, so I’m not going to wade into that debate, but you can make a solid argument in their favor while you’re chewing on some tenderly smoked brisket and tangy, kicky BBQ sauce. The actual BBQ is straight-up southern, but their Filipino heritage shines through in unexpected sides, like the garlicky rice that soaks up BBQ juices and the “Omy fingers” (mini egg rolls that aren’t necessarily authentic to either culture, but make for great snacking as you drive home with all the BBQ smells in your car). They didn’t have any boneless lechon (roast pig) on the weeknight I visited, but I’ll be back on a weekend to get some. So, obviously, I must have this chicken. 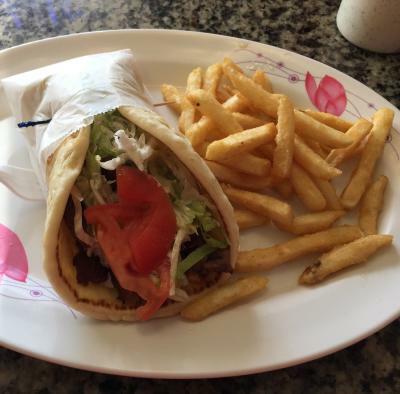 I’d been to Gyro Kebob House before, but I think I can be forgiven for having skipped the chicken gyro, assuming it was what it is in most gyro places – the boring option for children and picky adults who are freaked out by gyro meat. This is not that sandwich. It’s filled with beautifully spiced chunks of tender meat, cooked slightly crispy but not dry at all, topped with white sauce and the usual gyro accompaniments that all came together in such perfect harmony, I never considered going to the extra sauces kept in a nearby cooler. It reminded me of the best street food you’d find in New York City, at that one kebob truck everyone’s talking about. A note if you go: The location is great if you need a quick stop off I-95, but lousy in virtually every other way. It’s bigger than it looks, but that’s not saying much. There are four or five tables inside, and not uncomfortably cramped, but it can be hard to find a place to eat at peak moments. Parking out front is terrible, but there’s more in the back on the left side. None of this should stop you from going there right now. "George & Sons’ Seafood Market in Hockessin. You can sit at the counter and order a bottle of wine. I always let the shucker choose what he wants to open, and I&apos;ve never been disappointed. The lobster roll is phenomenal. It&apos;s two meals for me." On a Wednesday night when the kids were out of town with their grandparents, I took my wife to sit at that counter and order some oysters. George & Sons’ has no pretensions about what it is. It’s a seafood market with some tables and a counter on the side. You don’t come here for ambiance. You come for incredibly fresh fish. I started with a couple oysters, and taking Susan’s advice, I let the shucker choose. (The best of the bunch came from Barnstable on Cape Cod.) 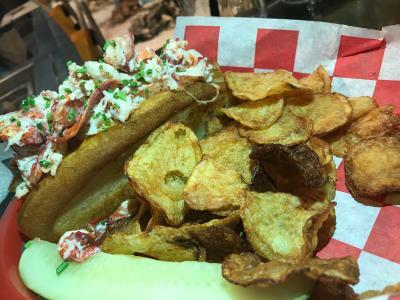 The lobster roll might be two meals for a Susan, but it’s one meal for a Matt … with big chunks of fresh, lightly-dressed lobster meat on a buttered, grilled roll that tastes of salt air and summer nights on the New England coast. After tucking in to the first bite, I knew I wasn’t leaving any behind. Homemade chips were a nice accompaniment. Also, I don’t know what gods were smiling down on the temporarily child-free couple at the bar, but it was half-price bottle of wine night, and the Willm Riesling was a crisp partner a shellfish feast.